3D Ebook Cover software to create ebook covers, software box shots, CD/DVD cases, spiral binders, bundles. Our software product enables you to create high-definition 3D product shots. create scenes for any taste. Produce high-quality covers for online and offline display. It is easy to install and even easier to use. This software product makes you look like a pro. Save your time and money! 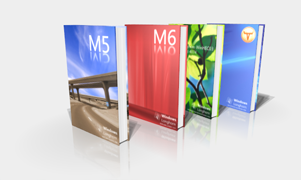 There’s no 3D skills required - Our Cover Software does all the work for you. Its easy to learn interface means you can be an expert user right away. It may just become your favorite hobby. Our product generates images of outstanding quality and unsurpassed realism. It combines the power of the CPU and graphics card for faster rendering. With 3D Ebook Cover, interactive realism is now a reality. Use the transform tools to move, rotate, or scale objects in the scene. Besides being convenient, this allows you to quickly get the results you want. To change images, just click on the image you want right in the Preview Window. 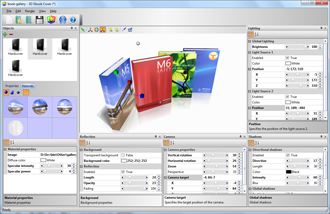 Create eye-catching software box shots, spiral binders, CD/DVD cases, bundles and much more. For more information see online help. Ray tracing is capable of producing a very high degree of visual realism, but at a greater computational cost. To increase rendering speed "3D Ebook Cover" utilize both the CPU and graphics card. This approach produces high-quality images even when working with the preliminary result in the Preview Window. Although incredibly computation intensive, ray tracing provides the most realistic shadows in order for you to obtain the most beautiful renderings. 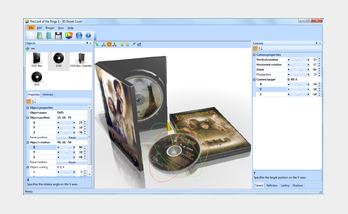 Create scenes for any taste using the built-in library of objects: software box, hardcover, paperback, brochure, CD box, DVD box, DVD/CD, magazine, membership card, spiral memo book, spiral notebook, Vista box etc. Select the objects you need, insert your images and press "Render", it’s that easy! What is "Easy to use" user interface? See it for yourself! Move, rotate, and scale object using the mouse right in the Preview Window. Fully control of reflection on the floor: length, opacity and fading. This makes images look even more realistic. You can easily output the rendered image with transparent backgrounds (PNG or TIFF formats) for use in your favorite graphics editor. You may also select a solid background color as well.